Harness the power of machine learning to get agreements done faster than ever. Intelligent template recognition will automatically fill in your most used documents, and two-way data flow reduces errors and eliminates data entry. Let DocuSign update Salesforce with the latest customer information so your records are always up-to-date. 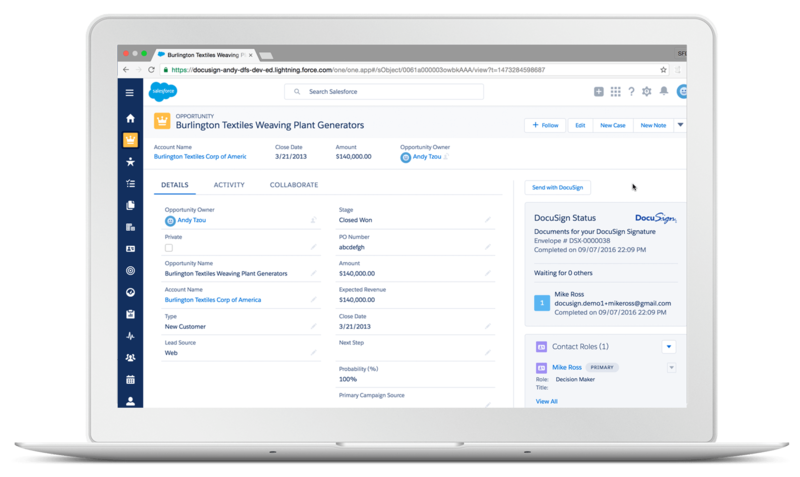 AppExchange’s most popular app, DocuSign for Salesforce, gets agreements done faster, simpler, and with increased Salesforce adoption. DocuSign is the industry standard e-signing experience your customers will love. Streamlined routing, custom workflows, and real-time status updates via Chatter so you can smash your quota. Ready to get started with DocuSign for Salesforce?